Passionate--formerly Moderate--now Liberal "Mormon": Why Was John Vaughan (1825) in Abersychan in 1847? The source is Colebrooke, Kim, A history of the British Ironworks, Abersychan, Gwent local history: the journal of Gwent Local History Council, No. 54 (Spring 1983), pp. 21, 23. The important lesson to take from this is that employee wages fluctuated with the market imposing capitalist conditions on the simplest of workers. Free markets are not free (please excuse the economic philosophy). And these wages are per week! 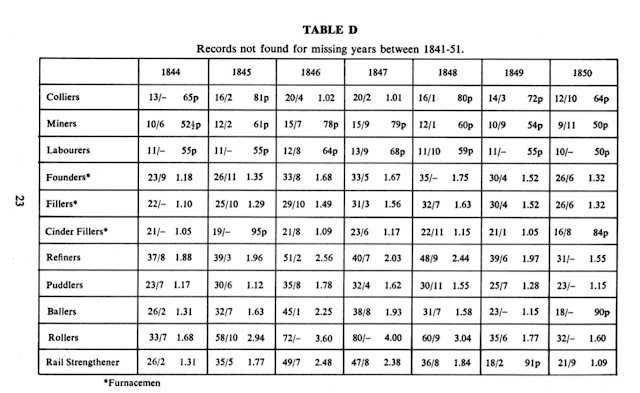 So when you see the excellent wages of 1 pound, 55 pence in 1847, think about how far that would go. (OK, a pound was worth about five U.S. dollars historically. There were 12 pence in a shilling and 20 shillings or 240 pence in a pound.) 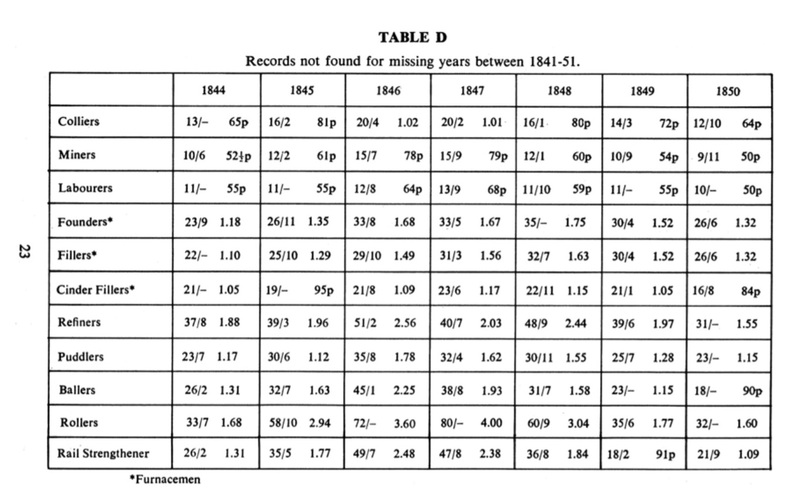 This chart appears to show pounds and pence converted to the modern decimal system. It was a six-day work week, so it comes to less than a dollar a day. Sure, prices were much lower as well, but you weren't getting anywhere in life without a few pounds in your purse. And as the iron masters generally controlled the prices in the town stores as well as most rents, they made sure that the workers never had enough surplus to leave or even clear out the debts owed the company. While this was reflected in the American song, "Sixteen tons and what do you get?/Another day older and deeper in debt/St. Peter don't call me cuz I can't come/I owe my soul to the company store!" it was even more true in Britain. The old days of feudalism in which you owed your life and labor to the Lord of the Manor were gone. The days of Capitalism were a form of wage slavery with no safety net. Abersychan was just a few miles down the road or the Brecon and Monmouthshire Canal. By 1850, John Vaughan and family were back at Llanfoist likely working for the Blaenavon Iron and Coal Company at Garnddyrrus Forge. So far, no records of Garnddyrrus have turned up.